Heading to the Hawaiian Islands? We’ve got it all sorted for you, from waterfall chasing to volcanic lava flows, Mai Tais to Coconuts, our Hawaiian travel guide is at your service fellow Companions. Hawaii is known to holiday seekers for its magnificent landscapes and summer sunshine all year round. Whilst images of sunbaking, shopping and happy hour are conjured up at the mention of this tropical paradise, the opportunity to dive deeper into the beauty of the island lies at the tip of your fingers. If you want to get off your beach towel and explore the islands, then put on your hiking boots and come with us as we welcome you to a Hawaii away from the Mai Tai’s and hotel pools. Here’s our list of top adventurous things to do in Hawaii. Adventures require energy, start each adventure with a healthy breakfast. 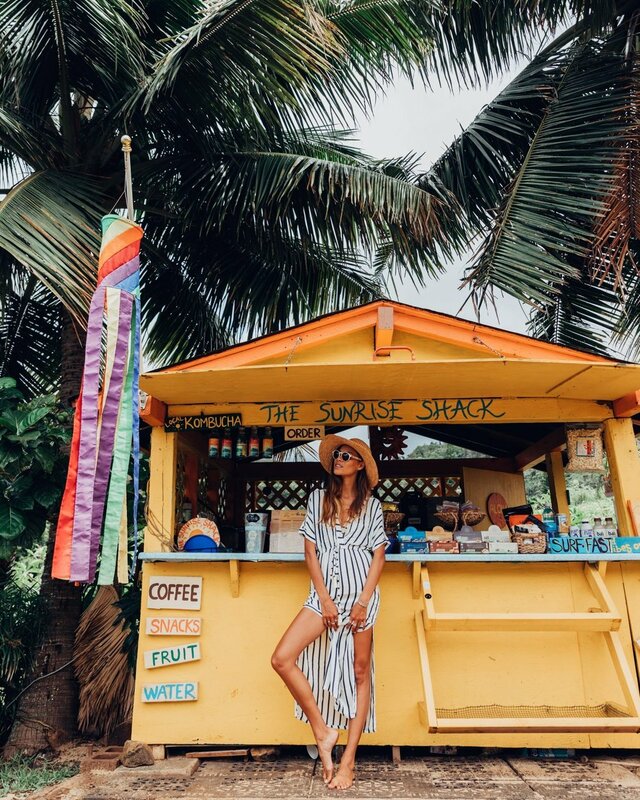 You will find the most glorious streetside shacks on the islands of Hawaii. Sunrise Shack, set on Sunset Beach on the North Shore of Oahu opens at 7 am. You can drive right up and order an organic bullet coffee & papaya bowls filled with superfoods. Also try Haleiwa Bowls on Haleiwa, Hawaii and Da Poke Shack. With waterfall after waterfall here, you are sure to get lost in your own little slice of heaven. Waterfalls fall into the ocean below or create oasis’ in the middle of magical jungles. Whatever your taste in falling water is, you are sure to find your waterfall flavour in Hawaii. You can explore the 12 tallest and most epic waterfalls or hike along Kauai’s Napali Coast into a lush jungle to Hanakapiai Falls. It’s about to get steamy in here! The Big Island of Hawaii is home to the largest number of active volcanoes. This hands down has to be one of the most energising, heart-pounding experiences on the island. With a history set deep in the existence of the Gods and Demi-Gods, you will find yourself in the territory of Pele, Goddess of Fire. Set at the edge of the ocean cliff, you can marvel as lava spews out into the sea creating a mass of red, orange and blue. If you’re adventurous, walk a few miles out to the base of the hill and watch as the lava slowly makes its way down the face in rivers of bright red and orange. Inside tip: Put on those hiking boots (don’t make the same mistake we did and wear Birkenstocks, fashion right?). Wake up. Hike. Eat. Hike. Sleep. Hike. That’s pretty much how we spent many of our days here in Hawaii and let me tell you, we did explore some beautiful locations and marvel at some incredible sunrises from high up cliff tops or what! From easy 20 minutes hikes, you can find yourself gazing out at the many Hawaiian Islands or crystal-clear seas below. For the daredevil type, there are numerous hikes that will leave you scaling across mountain ridges some many thousand feet above the ground as you stare at the beauty of Hawaii from above. Get lost in the tropical waters of Hawaii. Under the water’s surface, the ocean is flourishing with colour and movement where fish, turtles, dolphins and even sharks happily play in each other’s presence. Although all islands harbour these beautiful underwater playgrounds, the Big Island still offers some of the most pristine and uncrowded snorkelling spots of all the Islands. Check out Two Step to hang out with some reef sharks, or venture north and dive into the clear waters of Mauna Kea beach where you will find fish and reef life in abundance. If you’re hanging out on the island of Oahu, head down to Haunama Bay, one of the most popular snorkelling spots in the world, or Shark Cove on the North shore which offers fewer crowds. 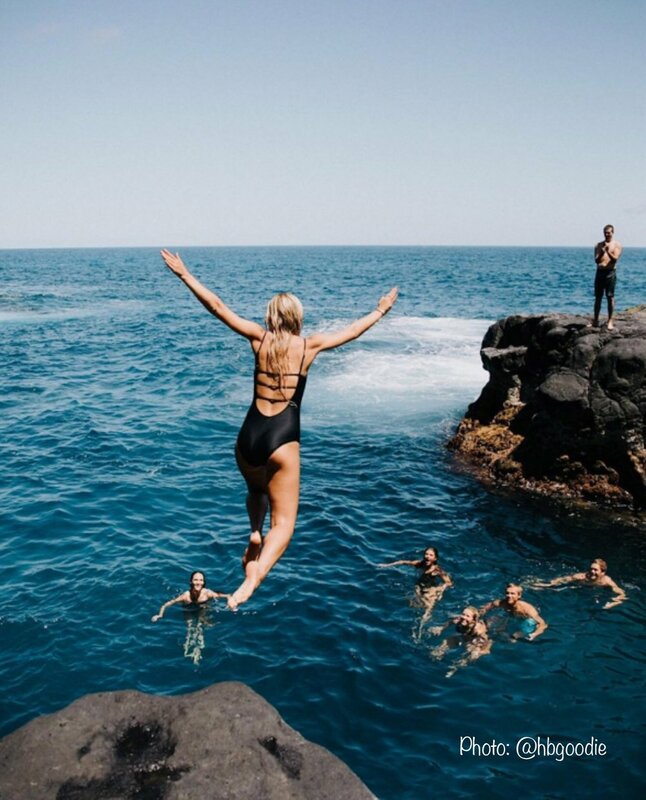 You can also jump off of the rocks at Waimea Bay and Waimea Rock. Each spot offers an underwater playground that you will want to hang out in all day. *PLEASE PLEASE PLEASE do not touch the marine life or stand on the coral. Disclaimer: This is not for the faint-hearted or those who still have childhood nightmares from Jaws. But if you’re like a few eager shark fanatics and see sharks more like the “Bruce” figure from Finding Nemo, sign up for a shark diving experience. You won’t regret it. There is plenty of options for viewing these creatures; from the safety of underwater cages or hard-core ‘jump straight in with a snorkel and a mask’ style. 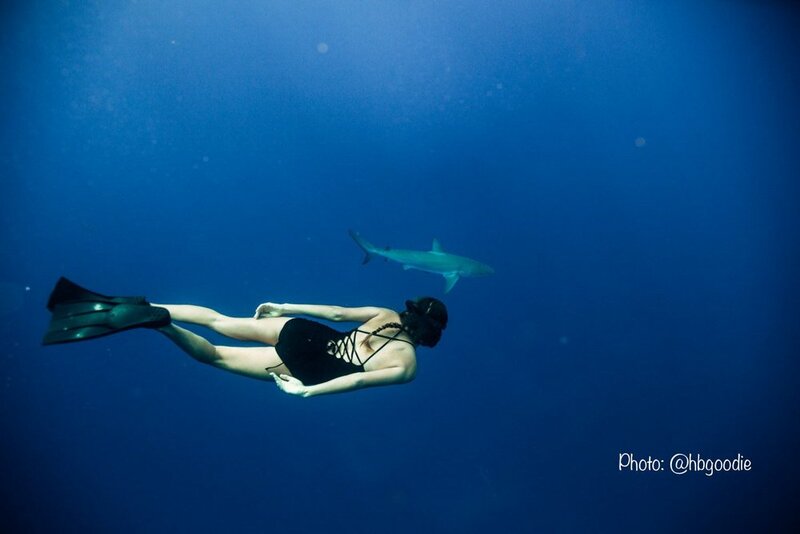 Swimming with sharks is so accessible and easy in Hawaii, you’d be silly not to give it a go. You will make buddies with them pretty quickly, and discover that there not as scary as they seem. After all of that adventure, you deserve it! Myth has it that the Royal Hawaiian Hotel serves the best Mai Tai around. The drink apparently originated in California in the 1930s but the rum-based drink is widely associated with the islands. According to Hawaii Magazine, Dukes Waikiki calls for POG (passion-orange-guava) juice, along with light Hawaiian rum and Old Lahaina dark rum in their recipe. Here are our 7 Essential Items to pack with you on your upcoming trip to the Hawaiian Islands! If this guide to the Hawaiian Islands has you itching to get there, jump over to Hawaiian Airlines to book flights! This article was originally written for & featured in The Venue Report if you’d like to check them out.